A Tuscan color palette is predominantly warm. Adding cool color accents give balance to your palette. The landscape of Tuscany inspires a rich palette of colors for decorating. The warm colors of Tuscan-style decorating are a reflection of golden fields and rustic walls. Tuscany's blue skies and lush foliage in rich green colors are the perfect accents for your Tuscan color scheme. Benjamin Moore Firenze is a warm and rustic paint color that is the perfect background for your Tuscan-style decor. Wonderful as an accent wall, Firenze could also warm up a kitchen or dining room. You can continue the Tuscan style color scheme outdoors with Firenze as a front door color. Sherwin-Williams Garden Sage is inspired by the soft and muted green foliage of Tuscany. Warmer than most sage greens paint colors, Garden Sage pairs well with rich russet and red. Garden Sage is part of the HGTV Home Paint Collection by Sherwin-Williams. Like acres of golden grasses, Sherwin-Williams Honeycomb is a stunning gold paint color, perfect for accent walls or furniture in a Tuscan-style room. If you're looking for a warm dining room paint color idea, Honeycomb is gorgeous! Try a rich gold with off-white trim paint colors, and dark wood furniture, for a Tuscan-inspired dining room. Behr's Serene Sky shines next to the warmth and fire of a Tuscan-inspired color palette. The coolness of this pretty sky blue paint color could be perfect as a ceiling color idea for a warm room with plenty of light. Behr's Sunny Bicycle YellowBehr's Serene Sky brings out images of sunflowers and long sunny days. As an accent in your Tuscan paint color scheme, Bicycle Yellow is perfect in an eating nook, or sunporch, or even a front door. 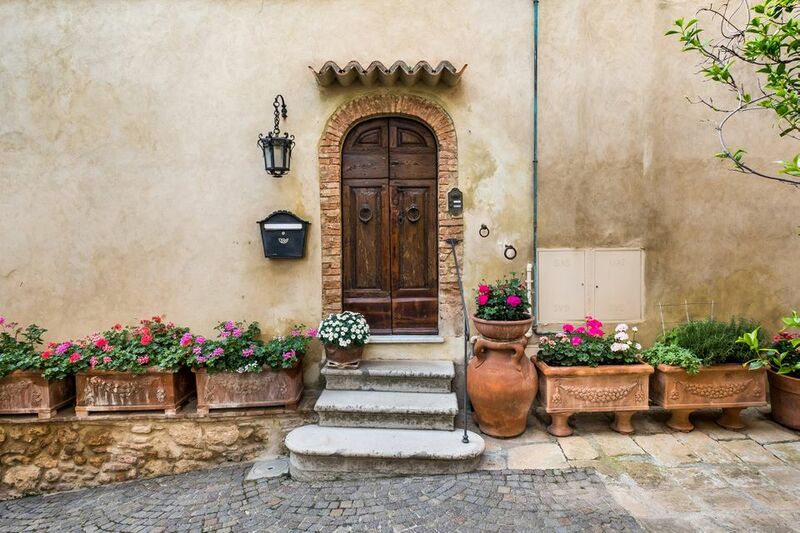 The decor of Tuscany is rustic, with heavy wood beams used through homes in the region. Valspar's Brazilian Brown has the quality of dark and weathered wood that is common in the Tuscan style. This color could be used as an accent wall to create drama, or as a backdrop for an otherwise plain fireplace. Tuscan colors always include the grapes of this region. At harvest time, the deep wine-inspired Tuscan colors are magnificent against the golds of the waning grasses. Valspar Sunny Bordeaux is a nice break from the intensely warm colors of Tuscany, but still very complementary to the color scheme. Benjamin Moore Interlude feels like wet sand under your feet on a hot afternoon when you add it to a warm Tuscan color palette. This neutral color is warm but very versatile. In a Tuscan-style color palette, it can play the role of connecting colors room to room easily. Interlude is a comfortable and comforting neutral paint color for living and family rooms, and perfect with an accent wall of any color. Olympic Paints French Violet is a rich, yet muted, lavender. Like the lavender bushes that thrive in a Mediterranean climate, the warm colors of the Tuscan landscape thrive with hints of cool color, like French Violet. Every Tuscany-inspired color palette needs red. Devine Color's Paprika is lush and satisfying even when surrounded by a variety of warm or cool colors. Paprika is a strong color, but never too bright. This is a wonderful and bold color for a dining room in a Tuscan-style color palette. Decorating in the Tuscan-style includes rustic accents, artwork, and architectural details. The highlight of any Tuscan-inspired room is the stunning Tuscan colors.